Two new books about what lives in our oceans. 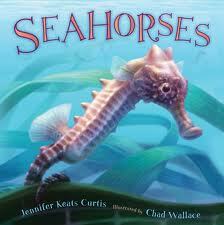 In Seahorses, Jennifer Keats Curtis uses rich language to give a brief overview of the life of this fascinating sea creature. In the warm, salty water, a baby seahorse swirls and somersaults like a tiny gymnast performing on an invisible mat. Looking a bit like a dragon, seahorses are very tiny and attach themselves to sea grasses or coral. To remain invisible to their predators, the seahorse has the ability to change their color to match their surrounding environment. From birth to mating to birthing its young (from fifty to over a thousand babies at a time), Curtis’s language is enhanced by the full-page illustrations, done in digital media, by Chad Wallace. The author’s note explains that though there are over thirty different species that live all over the world, the seahorse is becoming very rare. I bet you can guess who is destroying their habitat, reducing their food source from overfishing, using seahorses for medicine, crafts, and souvenirs...humans! To see the book trailer, go here. 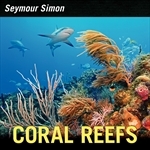 Partner Seahorses with Coral Reefs by prolific science writer, Seymour Simon. Large, full-page color photos capture the magical world of these fragile environment. Simon covers the main types of coral (hard and soft), the three kinds of coral reefs, along with the inhabitants that are unique to these delicate ecosystems. Imagine diving beneath the waves into the warm waters of a tropical ocean. You're surrounded by strange rock shapes with brilliant colors: reds, greens, blues, oranges, and pinks. The colors change and shimmer and the waters are full of equally vibrant fish. For a glimpse inside Coral Reefs, go here. Coral Reefs does contain some back matter: glossary, websites to learn more about coral reefs, and index.